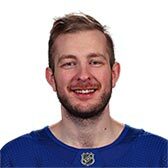 Linus Ullmark is 6' 4 and weighs 212 pounds. He is currently 25.7 years old. Was absent from today's practice due to illness.